well folks, from what we've seen things have been rough for this great EMU. first there's SVC w/ the P1 rom error. this doesn't bother me so much. u can play that game through a few times and that'll be it, I've already deleted it and I honestly won't miss it much. but samurai showdown 5... I've never seen anything by the means of a "bank error" before, and I wouldn't have a clue where to start. I'm not gonna biatch about how I can't get them to work, cuz I know at the moment nobody has that answer. this topic isn't about that. I put this topic up because I'd like 2 discuss what's up. why these new games are having these troubles. what the usual process has been to fix games in the past, and if they are applicable to these new games. if they aren't then why not? what don't we know? is the premier neo geo emulator finally on it's way out? Being a NeoRage fan I know where you're comin' from.....As far as SamSho5 goes, I've got it working perfectly on NeoRage. Well, I had to D/L a different NeoRage, but it works flawlessly so far. I too goT the "Bank Error" response and was pissed that I had to use Nebula, then I added a patch and I didn't get the "Bank Error" but some screwed up graphics! Finally I found a website that mentioned the rom names for the "c roms" needs to be changed. Here is what you need to change them to. ANYONE WITH METAL SLUG 5 NEWS......POST IT! Here we are experianced and a so called noob comes along with a bunch of fixes for some games that i can not be bothered messing around with because i know i may screw them up. Got any screenshots of SAMURI showdown 5 runing in Neo Rage? Oh yeah and whats the files name for Neo Rage? It wont come uop in neo rage at all not even with the special emu which i have had for ages anyway. Here this is what i have in my ROM i treat it as a ZIP. Do i need to rename them for neo rage ? like the aformentioned? What a pice of flocking junk i am getting really pissed of i cant belive i have to play this in nebula when over 50 people SAY the have this working in neo flocking rage. I have renamed, i have tried countless P1 ROMS i have even masterbated on my hard drive in attempt to get it to load in neo rage. The P1 PROBLEM REMAINS WTF is up with that? I cant even get a bank error. Here is my problem with Neo Rage. Emsley, just make a copy (or serveral copies) of your rom, stick them in new folders and just try the rom name changes I posted. I don't know why it works on only the NeoRage Final (or whatever it was that came from www.neogamez.net) because it doesn't work on any of the other NeoRages I D/L. The rom file is ShaSho5.zip and NeoRage picks it up as SAMURAISHODOWN(?). Don't worry about messing the roms up, I was really apprehensive about it too but soon realized it's kinda tough to completely screw these roms up! 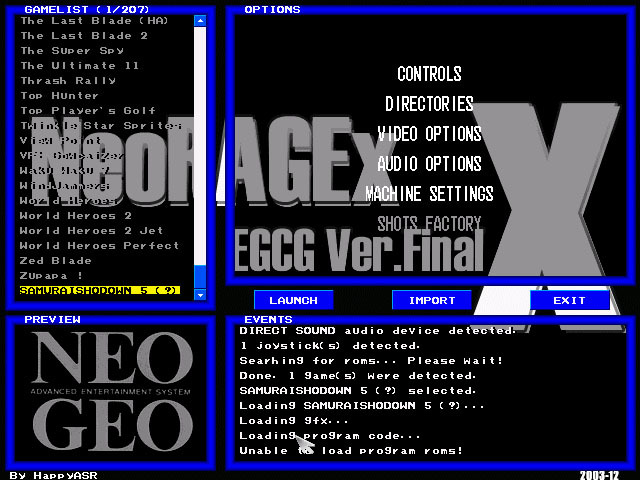 I also know that this version of NeoRage will play SVC Chaos, but for some reason there is no sound effects whatsoever when I do run it (though it plays fine). I'm getting all my info. from just searching the web, mainly forums which unfortunatly are in spanish half the time! I live in Texas, you figure I could speak spanish better! I have also tried to rename the C ROMs but i get the same error everytime.